If Trump Was Colluding With Russia Prior To The Election, Why Would He Need To Establish Backchannel Communications With Russia After The Election? Maybe we have more cases of people in the Trump administration lying about their contacts with Russia. There is certainly a long list of examples of this. The connection to Blackwater is of some interest, but not terribly surprising considering that Erik Prince had a loose connection to the incoming administration, being the brother of Betsy DeVos. Besides multiple lies involving members of the Trump administration, adding to questions of obstruction of justice, there are serious questions regarding money laundering and possibly other financial crimes. Where the Russiagate hysteria falls apart is with the claims from many Democrats that collusion between Trump and Russia altered the election result. To date the claims that Russia altered the election result have been falling apart and there has been no evidence of any successful collusion. While Russians did entice Donald Trump, Jr. with claims of information on Russia, showing that he would have had no problems with such collusion, it turned out that Russia did not actually have information to provide at the Trump Tower meeting. There was also the report that Jared Kushner had attempted to set up backchannel communications between the Trump transition team and Russia after the election. However, if there was any nefarious goal here, it was suspected to involve Kushner’s financial problems with his Manhattan property. 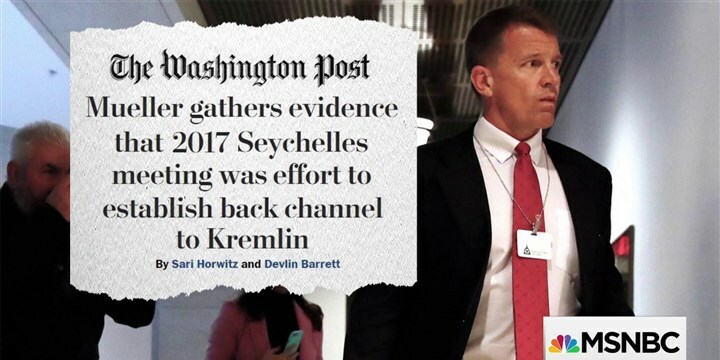 The question which reports such as this raise is that, if there was collusion between the Trump campaign and Russia during the campaign, why were there so many efforts to establish backchannel communications after the election? If there was collusion before the election, they would have already needed to have had some means of communication before the election. While such attempts to communicate with Russia just prior to the inauguration may or may not have been for nefarious purposes, maybe Mueller is onto a crime here with attempts at establishing backchannel communications with Russia before the election–especially with individuals lying about such attempts. However, it makes little sense to both claim that Trump was successfully conspiring with Russia during the campaign, and that crimes were committed in attempting to establish backchannel communications after the election.